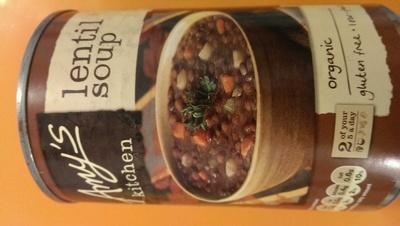 How much sugar in Lentil Soup Amy’s Kitchen? How many small sugar cubes (4g) corresponds to 400 g of Lentil Soup Amy’s Kitchen ? 400 g of Lentil Soup Amy’s Kitchen contains 5 g of sugar, which is equivalent to 1.2 small sugar cubes (4g) or 0.8 bigger sugar cubes (6g). Use the + buttons to indicate how many small sugar cubes (4g) corresponds to 400 g of Lentil Soup Amy’s Kitchen.